Jack Bliss, a notorious rustler, who operated in Northern Wyoming in the early 1890s, was a product of the economically depressed area, caused by the severe winter of 1886-1887 and took to the outlaw trail like many cowboys of that era. 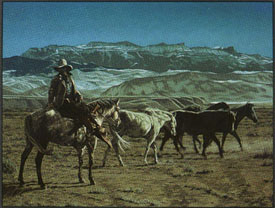 In 1892 efforts were being made to rid Wyoming of these outlaws and two range detectives were sent out to capture Jack Bliss. While trailing a herd of stolen horses through the Bighorn Basin to the Jackson Hole Country, Bliss was hunted down and killed by these range detectives on what is now known as Bliss Creek and Bliss Creek Meadows at the head of the South Fork of the Shoshone River. Exclusive issue of only 250 signed and numbered, however, this print is only available when you buy the set of all ten prints for $3000.00. Image size - 18" X 24".